It is possible to achieve damaging pressure in kayak air chambers by over inflating or storing a fully inflated kayak in high heat. High heat is also a cause of seam failures as the adhesives are compromised or weakened by over-heating. We recommend releasing pressure during storage and keeping the kayak in a cool environment / covered to protect from excessive heat. This is a drain for the bilge area which is also required as a vent during inflation and deflation. 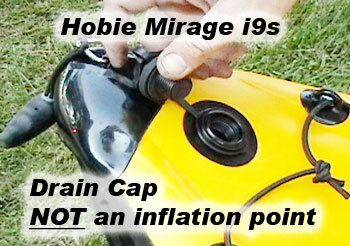 This cap should be removed at all times during inflation and deflation to allow air pressure to equalize in the bilge chamber. This area is NOT to be pressurized. Concern: Pressurizing the bilge chamber can damage the scupper fittings and cause unnecessary concern about the area “leaking”. This bilge area can be drained of water by opening the cap and tipping the boat onto its bow. I have added several instructional video segments to our support pages about unpacking, inflating, deflating and re-packing Hobie Mirage inflatables into their travel bags. Scroll down to the inflatables product section. This is the method that I use to pack up my i11S. We used this method on both of our i11S inflatables when we took them from Brisbane to Vancouver Island, BC. Drives were taken apart and transported in our regular luggage. All was good until the TSA folks in LA decided to remove the shrink wrap we added in Brisbane and unpack them. They didn't pack them back in the same way and we ended up with a big hole in the bag where the seat rubbed on the flight from LA to Seattle. I wasn't a happy camper. All in all they traveled really well in both directions.